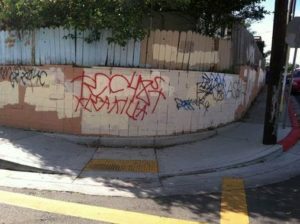 The Talmadge Patrol has invited our Councilmember, Georgette Gomez and our council rep, Matt Yagyagan, to participate in our graffiti clean-up and to help with the paint project. 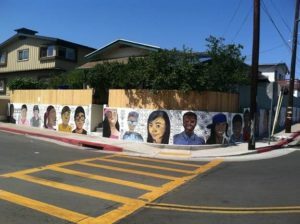 Phase 1 of the mural restoration project will be this coming Saturday, April 14 from 9:00-12:00. We will be removing the graffiti from the mural and area also painting over areas of the mural with fresh paint. Any time you can spare to come help is much appreciated. Just bring yourselves and the Talmadge Patrol will supply the paint supplies and graffiti removal supplies. Thank you to Councilmember Gomez’ office for sharing this project with us, and to our Talmadge neighbors who continue to support the efforts of the Talmadge Patrol, our neighborhood 501c3 non-profit. Our Talmadge community has supported the patrol for 10 years now! And with our neighborhood volunteers’ efforts and funds received solely by neighborhood donations and grants, we have been able to continue to give back to the entire Mid-City community with projects such as these. The Talmadge Patrol supports several main projects that we believe help deter crime: (1) graffiti removal; (2) Clean Alley Program and Clean-Ups; and (3) Dusk to Dawn Lighting Program to help light up our alleyways and dark areas of Talmadge. We look forward to seeing you next Saturday for any time you can give. If any of your children or teens need community service hours for school, please bring the forms and we are happy to complete those on behalf of the Patrol 501c3 non-profit. Morning refreshments will be provided. Please RSVP to Kelly at kwaggonner@cox.net.